Dursley Town Council originated from the 1974 Local Government reorganisation and since then the "chair" position has been known as Town Mayor. Since 1974 there have been 12 people who have held the title of Town Mayor, with the most recent, Cllr Neil Grecian being appointed by Council on the 11th May 2016. The longest serving Mayors are Jane Ball who served 10 consecutive years (2005-14) and Michael Maxwell Cornock who served over 9 years during three terms between 1975 and 1991. 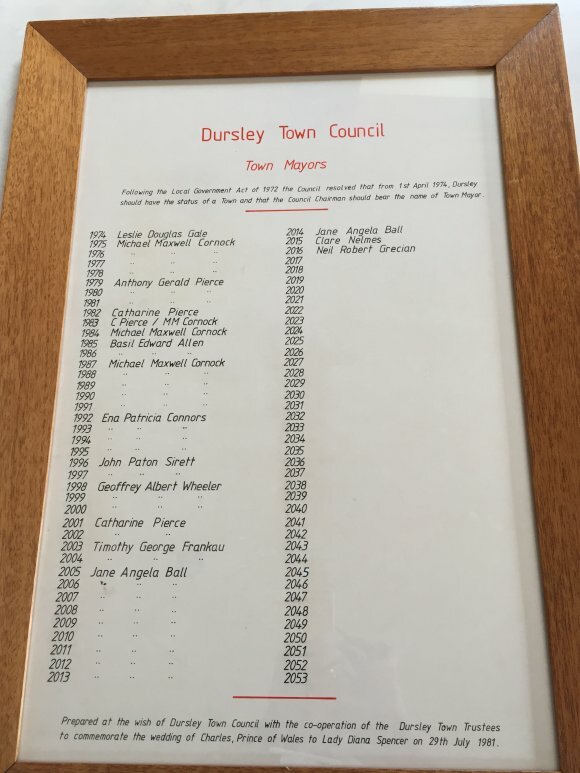 In 1979 Anthony (Gerry) Pierce was appointed Town Mayor and he was the first Mayor or Chair of the previous Dursley Rural District Council, dating back till the 1890's not to have been born in Dursley and in 1982 his wife Catharine was the first female Town Mayor. The record of Town Mayors since 1974 is kept in the Town Hall.